Camp sessions are available beginning on Mondays starting June 1 through August 31. 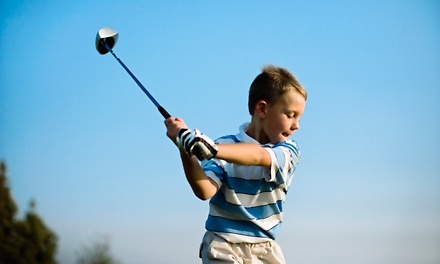 Sessions run Monday–Friday, 8:30 a.m.–11:30 a.m., during which kids ages 6–11 learn the basic techniques of golf. Kids should bring a snack or money to buy one in the coffee shop; gear rental is included. Registration required. Limit 4 per person. Limit 1 per child. Valid only for option purchased. All goods or services must be used by the same person. May only use one voucher per child for one week of camp. Valid for ages 6-11.